Learn the skills of Balance, Streamline and Whole-Body Propulsion, via a combination of drills and Whole Stroke with Focal Points. Be disciplined and rigorous in practicing efficient, fluent stroking patterns. Never practice inefficiency in order to go longer or harder. Six of us — Terry Laughlin, Hash al-Mashat, Greg Sautner, Dave Barra, Ann Svenson and Cari Laughlin – of whom only one was a particularly distinguished swimmer previously, and three of whom were ‘adult-onset’ swimmers, have cumulatively won some 15 US Masters open water titles at distances from one mile to 10km. Terry, Dave and Ann have each finished a season as the top-ranked open water swimmer in their Masters age group. Terry and Ann have both broken National Masters Open Water records for their age group on multiple occasions. Terry coached the sprint group on West Point’s varsity swim team, who competed mainly in 50- and 100-yard races in NCAA competition from 1996-99. The primary difference in applying the system to collegiate sprinters is that we worked in Stroke Rate ranges 100% higher than typical in triathlon and open water swimming. Prior to being introduced to the system, this group had been the most underperforming on West Point’s varsity team. Between 1997 and 1999, they won 66 percent (4 of 6) Outstanding Swimmer awards at the Patriot League championships, though they accounted for approximately 5 percent of swimmers in the meet. TI Coach Lou Tharp began working with the West Point Tri Team in the fall of 2006. The previous spring the men and women had placed 14th and 19th respectively at the National Collegiate Triathlon Championships. In Lou’s first year, they improved to 3rd and 9th places and in 2008 to 2nd and 5th. While their swim training changed radically under Lou, their bike and run workouts remained essentially the same. Lou had no experience in those areas so the team’s land training was guided by officer representatives from the Academy and team captains. The most improved individual was Nicholas Sterghos, shown below synch-swimming with Terry starting at 1:21. (Note the similarity with the form shown in Terry and Shinji’s synch-swim.) Nick was a cross-country runner forced to give that up after his sophomore season because of stress fractures. 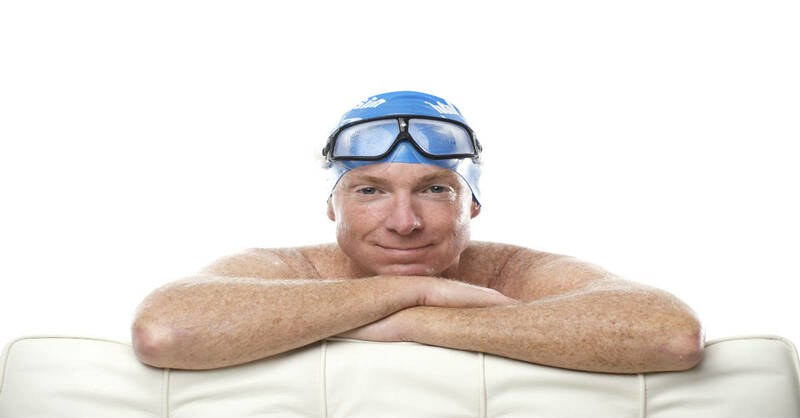 In late 2006, he joined the tri team and did his first race in May 2007, swimming 1500 meters in just over 27 minutes. Two years later, in June 2009, he swam 1500 meters in 18:13 at the Philadelphia International Triathlon, which is possibly the most dramatic 2-year swimming improvement in triathlon history. Nick was invited to join the USA Triathlon Resident Team at the Olympic Training Center, but is currently deployed to Kuwait as an Army First Lieutenant. When Lou became the team’s swim coach, he and I designed evaluation sets — geared to the 1500meter swim leg of Olympic distance triathlons — to guide practice planning. These sets were repeated monthly with practice sets adjusted accordingly. Between evaluations, they worked on continuously improving and imprinting the component skills of Balance, Streamline and Whole-Body Propulsion. The evaluation consisted of a ‘ladder’ series of 250-, 500- and 750-yard swims. Team members were first asked to complete a 250-yard swim without exceeding their height-specific stroke count. (The recommended SPL range for Nicholas’s height of 5’8” is 15 to 18. Lou set the bar higher, asking Nicholas to keep his count between 14 and 17.) They could only progress to 500, upon completing 250 without exceeding the highest SPL in the range for their height – and only attempt the 750 after succeeding at 500. Once a swimmer completed 250-500-750 with the assigned SPL, they progressed to a higher level challenge: Complete each of the swims at consistent SPL and consistent Pace. I.E. keep both Stroke Length and Stroke Rate consistent for the entire swim. Early in their development, athletes were expected to complete these sets at the top of their height-specific SPL range. As their skills deepened, it was expected they would progress continuously to be able to complete them at the lowest count in their range – and consequently at faster paces, even if Stroke Rate remained constant. Specific to the athlete. While Nicholas was striving to complete 250-500-750 at 14 SPL and a specific pace, a less-developed teammate could be working to complete the same set in 17 strokes – and be equally challenged. Mathematically Precise. SPL and Pace are very concrete metrics. On every length of every set, each athlete has exact and personal knowledge of what represents the improvement they’re seeking. Targeted to Skills that Win Races. While aerobic capacity is no guarantee of placement, any triathlete who can maintain unvarying efficiency and pace will outperform 90 percent of the field in a TriSwim leg. Team Effectiveness The West Point triathletes rose so far in Collegiate Triathlon rankings not because they swam fast. Rather because they (i) spent fewer heartbeats than athletes on other teams, while (ii) reaching T1 in great position as a group. Effective swimming became routine for the team, because their practice was systematized and therefore the entire team was in great position and feeling very fresh at the start of the cycling leg. Read the details of how Lou trained Nicholas and the West Point Triathletes in Lou’s book The Overachiever’s Diary. OK So I have started doing this practice of limiting duration and speed based on SPL and I am just looking for affirmation that this is indeed to way to proceed. When I am fresh I can hold a 16 SPL for a 100m. As I tire I decrease my distance to accommodate a 16 SPL (75m, 50m 25m). Will I improve? It takes a lot of energy to hold the 16 SPL and I feel like I am starting from square one. Need encouragement. Kristine How did you decide your target should be 16SPL in a 25m pool? Are you 6′ tall? That’s my height and 16SPL is a reasonable target for me. If I were shorter my SPL target would be higher. If you set your SPL target at too low a number, indeed it will take a lot of energy to maintain. The goal isn’t to have the lowest count, but the OPTIMAL. That means the one that minimizes energy cost for any distance and pace. How do you determine SPL? I have attended TI clinics, but was never told mine. I am 5’5″. With my SPL in mind what tempo should I then set my trainer at to start these 250m sets you describe in your blog? I’m swimming my first 1-mile race at the end of June and my goal is to be able to hold a nice, steady pace the whole time. I am 5’5″. On the chart in part 7 I thought it said 16 to 19 SPL. How do I know my optimal count? How do you determine your SPL? I’ve been to TI clinics, but have never been told what my range should be…I’m 5’5″. Once you have your SPL how do you know what to set your Tempo Trainer at to begin the 250-500-750 sets you’ve described? Thanks. That chart was for 25 yd pools. For 25m, it would be approx 10% higher – so 18-21. And we recommend people start on the higher side and gradually work toward being comfortable at lower numbers within their range. I’m still trying to figure out where to go next in the pool. I checked with the pool I swim in and it is indeed a 25 yd. pool. I have been studying your technique for about a 1 ½ years. I have shaved 1 minute off my 400 with open turns (from 8 to 7min) and swam a long distance of 7.69 miles (in 5 hours, at least ½ to 40 min of that was drinking and eating stops) with ease. I thank you for sharing your technique with all of us. So now I am at a point where I can hold 18 SPL at 1.3 sec. I can decrease my stroke count and swim faster for short distances. My goal is to shave another minute off my 400 (with flip turns) and swim 3 miles an hour for long distances. So do I keep decreasing my tempo trainer and keep my SPL the same? Any thoughts? Use the stroke count numbers for 5’7″ on the chart, then add 10% if pool is 25m. For how long can you maintain 18spl at 1.3. 25 yds, or maybe 500 yds.? And what happens to spl when you increase tempo to 1.28, 1.26, etc? If you can improve any of the three while keeping the rest constant, you’ve improved. The next day find another way to test your ability to improve one metric while preserving the others.